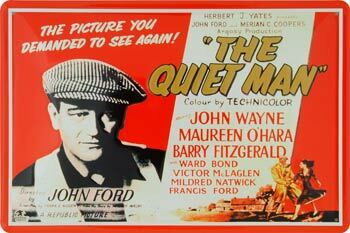 Seemingly a big departure for Ford and Wayne, The Quiet Man actually follows a familiar Western structure - a mysterious stranger arrives in town (by train here, as in The Man Who Shot Liberty Valance, 1962), falls in love and ends up reluctantly fighting a duel. Little surprise as the script is by Frank S. Nugent, the genre scribe who would go on to write The Searchers (1956). As usual there's plenty of lush cinematography on show from Winton Hoch, who captures a windswept and verdant Emerald Isle of trailing stone walls, brooding hillsides and babbling brooks. Every stereotypical national trope going is out in force (flat caps, cobblestones, chronic alcoholism played for laughs), not least in the person of Barry Fitzgerald's whimsical "match maker" Michaleen Og Flynn, a bowler-hatted leprechaun who spends his days driving oxen and humming 'The Wild Colonial Boy' with a pipe clamped between his teeth. Fitzgerald though (seated below) is an utter joy throughout and the scene in which he greets the sight of Wayne's smashed marital bed with an awe-struck cry of, "Impetuous! Homeric! ", is a scream. Ford's film was a real family affair on set. Maureen O'Hara's two younger onscreen brothers are really her own, while John Wayne's four children feature in the horse racing scene at the beach. Francis Ford, the director's elder brother appears as the formidably bearded Dan Tobin (above, left), as does Fitzgerald's, Arthur Shields, playing the kindly Protestant Reverend Playfair. The chemistry between the leads stemmed from the great friendship between Wayne and O'Hara, this the second of their five films together, the others being Rio Grande (1948), The Wings Of Eagles (1957) McClintock! (1963) and Big Jake (1972). There are any number of great moments in The Quiet Man. The wild, wordless kiss in the cottage stands out but it's the fist fight between Wayne and McLaglen under the Marquess of Queensbury rules that most people remember. A film generally thought of as a charming melodrama that presents a nostalgic, rose-tinted view of Yeats country, the tragedy that underscores Wayne's character is actually very affecting and crucial to The Quiet Man's appeal. You could do a lot worse than dig this one out next St Patrick's Day. P.S. Well worth checking out if you like The Quiet Man is Geordie (1955), a hopelessly inept British variation from the Sidney Gilliat-Frank Launder stable based on a novel by David Walker. Attempting to do for Scotland what Ford's film did for Ireland, Geordie tells the story of a gamekeeper's son who grows up to be an Olympic champion hammer thrower. Absolutely asinine but also rather sweet, it stars Bill Travers and Alastair Sim.